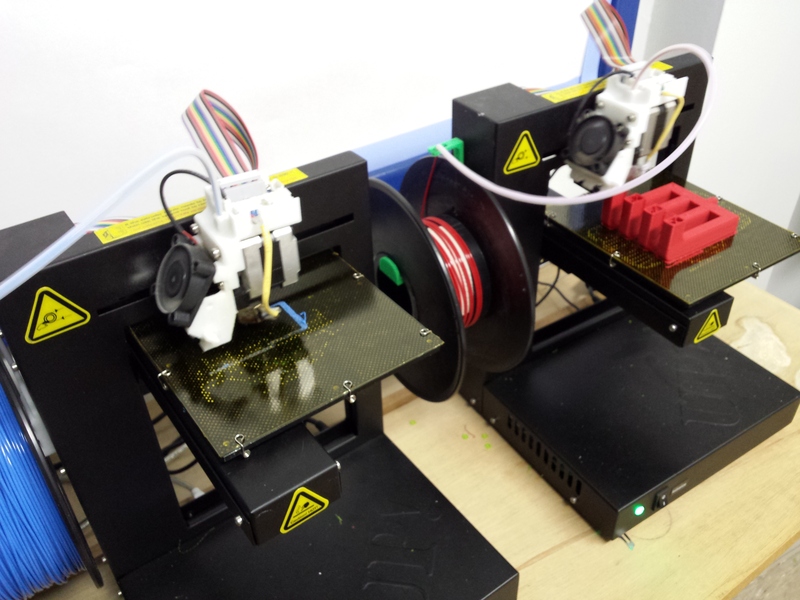 Getting started with 3D Printing in the classroom. I am 35 years old, I am in my 14th year as a DT Teacher and my 11th year as Head of Department. Whilst planning how to start this blog post I had a think back to what I loved about DT when I first walked into a workshop as a Year 7 pupil in 1991. Mostly it was the smell of timber and coolant from either the lathe or milling machine, the selection of tools neatly in the racks, just waiting to shape my piece of raw material into something, that at the time I thought was magical…most probably a pencil holder. I think I have had a selection of some truly amazing teachers that inspired me to become a DT Teacher myself. I always though that if I enjoyed coming to DT lessons as much as I did, then what a truly amazing job being a DT Teacher would be! I feel that during my secondary school and college years I was taught DT in a very traditional way. I think I gained a solid understanding about shaping/joining timber, plastics and metals using most methods known. I then went to Sheffield Hallam University to continue building on my current knowledge, but developed new skills using PIC technology/electronics and CADCAM. At the time ProDesktop was just making its way into schools and 3D printers had not even been thought of. I would say that I have had to learn as many new skills since starting as a teacher as I knew to begin within 2001. Whilst some skills I have been taught over the years are not used much at my school, such as welding/aluminium sand casting, I still think it is important to know these skills as it is more the lacking of facilities/curriculum time that prevent me teaching this to pupils rather than a desire to keep the knowledge from them. I can only speak of and criticise my own practice, but since most of the material that we buy in my department comes in sheets and planks, it is no wonder that lots of the pupils end up making something that resembles a box. Don’t get my wrong, they have been mighty fine boxes…they have been Memphis Clocks, Art Deco MP3 docking stations, De Stijl lamps and desk tidies, whilst I’ve been very proud of them, they have been boxes at heart. If ever a pupil wanted to make something that looked more organic (heaven forbid), we have done so, but we have wasted quite a lot of material by layering up, sanding away and discarding sometimes as much material as we end up with! I am sure that because I encourage my pupils to sketch in an isometric style using the method of crating as a starting point….they already have a box drawn on the page…they then have the design problem of sketching something for their MP3 player PCB/Battery to go in….why re-invent the wheel, when you have just drawn a perfectly good box? As far as I am concerned, I need to change my mind-set and teaching strategy to overcome the production of boxes and plan how to teach the pupils to consider 3D printing as the method of manufacture! 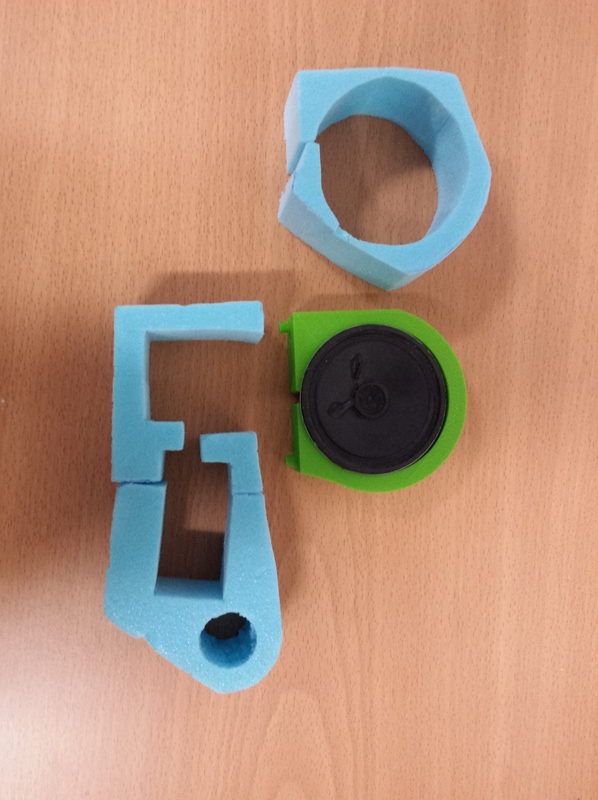 Since this blog post is about getting started with 3D Printing, you should be able to see part of an MP3 Prototype that a pupil I teach has made. They started off by designing with blue foam rather than sketching. The pupil who made this model drew round his battery, PCB and speaker on the blue foam, then set to work shaping it with a coping saw and sander. The shape he has ended up with is far removed from a traditional box. In the past when pupils have made an MP3 docking station they have made an attractive pine box, used dowel to join the corners, turned aluminium feet to hold it off the table top, they have laser cut some acrylic sheet to cover the front, and cut out a decorative pattern from the acrylic so that when the speaker has been glued behind, you can hear the sound from the box. 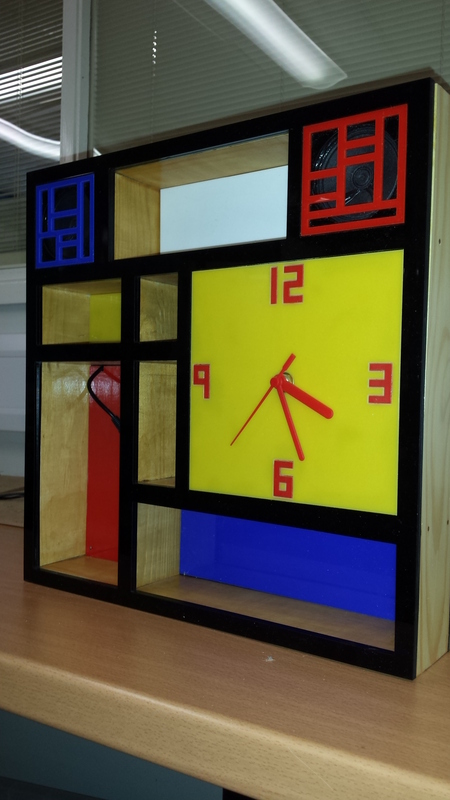 The photo of this GCSE project scored a moderated 32 marks for the practical aspect of the course. It is made up from boxes within a box :-). Its function is an MP3 Player, Clock and Storage unit. It measures 600x600mm and is 80mm deep, huge for the function really, but well made and finished, very typical of the project type that many of my pupils have made. There is nothing wrong with sketching and then drawing from a sketch to a CAD package. From past experience though, if I have ever sat with a pupil and helped them draw something on Autodesk, that has started off as a sketch, I have always found that even the most able of pupils have missed off some dimension that leaves you guessing how big part of a drawing is going to be. To fix this, I get all pupils to start with a 3D sketch, then make a full sized 3D blue foam/card model of the final sketch. Once the pupil is happy with the final model I get them to sit at a PC with Autodesk loaded up, a ruler and some digital callipers. I either get them to start with a profile drawing that can be extruded (depending on what they have designed), or they will start by drawing a block that was the same size as the original piece of blue foam. It is then just a matter of careful measuring to remove the parts of ‘foam’ that you no longer need. As long as a pupil can draw using a revolve and do simple extrusions to add/cut material they can pretty much draw most things they want to make. When we got our first 3D Printer, it was an Up 2 Plus. The first thing I did was download an STL file from a sharing site for a pencil pot. Twelve hours later the print was done! Since then I have learnt more about the software settings and could print the pencil pot in about 4 hours :-). The main concern I had was how to get the pupils excited about designing for 3D printing, if I knew that I could never do 4 hour prints for each of them….then I had a brain wave! I thought let’s get them to make a key ring! I assume that most DT teacher have either made an acrylic Key ring themselves, or have taught pupils to cut/shape/polish acrylic key rings in their own workshop at some point? After I had designed my key ring and printed it in just 8 minutes I thought that I was onto a winner! After a practice at making some key rings for most people I knew, I had time to reflect on what a poor idea this actually was. In a way, I was still stuck in my old mind set of 3D printing something that I would normally be made from acrylic sheet (not that I make key rings anymore). Whilst I think that 3D printing is amazing, I think that the real learning takes place with the designing, either on paper or screen. The pupil actually learns very little seeing their design being made. It is the thrill of getting your design printed that is the reward for designing something brilliant! Now I encourage pupils to design with plasticine and blue foam, to look at images from nature and biomimicry design in a hope they will produce something a little more Zaha Hadid than Rubik’s Cube. I am sure that my current Year 10 Product Design class will make their fair share of pine boxes for their desk tidy/MP3 player/lamps, but I hope to encourage them to ‘think outside the box’ (haha), and design maybe an exciting phone holder/headphone wrap or draw handle that could not be made in any other way other than to 3D print it! Hi John! I am an graduate in instructional design and technology department. I’m doing a master project about 3D printing technology in classroom. I have a question for you. From what I read online, I know that you will have or already had a training about managing print time. I want to know more details about. Would you be able to contact me at llin1@g.emporia.edu? Thank you.